For several years, two of America’s top ten big cities have been extreme outliers when it came to tearing children from their families. When entries into care were compared to the number of children living in poverty Phoenix had the worst rate of removal among big cities; Philadelphia was second. Well, now that's changed. Now children are more likely to be consigned to the chaos of foster care if they live in Philadelphia than any other big city in America. (Phoenix remains a very close second.) Details are in the updated NCCPR Big City Rate-of-Removal Index. So now, children in Philadelphia are more likely than children in any other big city in America to have to endure the rotten outcomes of foster care placement – and the risk of abuse in foster care itself. Prompted in part by great reporting by both the Arizona Republic and the Arizona Daily Star, which went all over the country highlighting places that succeeded in safely curbing needless foster care, Arizona has begun to get serious about safe, proven alternatives to taking away children. The rate of removal in Phoenix is still awful, but not as bad as it was – and no longer quite as bad as Philadelphia. That’s right, even in the place that elected Joe Arpaio sheriff, they are more careful about harming impoverished children with needless foster care than they are in Philadelphia. How bad is Philadelphia? The rate of removal is triple the rate of New York City and quadruple the rate of Chicago. Of course, one could point out that there have been horror stories about deaths of children “known to the system” in New York City and Chicago. But there also have been such cases in Philadelphia. Does anyone seriously believe Philadelphia children are three times safer from abuse than children in New York and four times safer from abuse than children in Chicago? 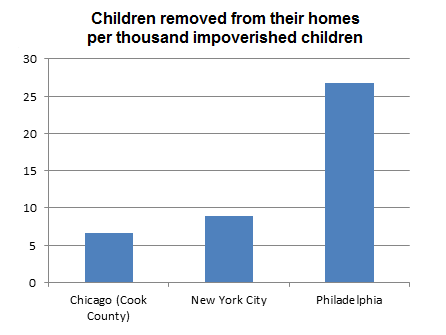 By the way, if you don’t factor in poverty, Philadelphia’s record looks even worse.